Dr Fredros Okumu is the IHI Director of Science. He originally trained as a Public Health Officer in the College of Health Sciences at the Moi University in Kenya. He holds a Master’s degree in Applied Parasitology from the University of Nairobi, Kenya, and a second Master’s degree in Geo-information Science, Earth Observation and Environmental Modeling from Lund University, Sweden. In 2012, Dr Okumu earned a Doctor of Philosophy degree in Infectious Tropical Diseases from London School of Hygiene and Tropical Medicine, and is currently working towards a Master of Business Administration in International Health Management at the Swiss Tropical and Public Health Institute, University of Basel, Switzerland. Dr Okumu is also an Associate Professor of Public Health at the University of Witwatersrand, South Africa; a Visiting Researcher at the Federal University of Minas Gerais, Brazil, and a honorary Research Fellow at the Institute of Biodiversity, Animal Health and Comparative Medicine, University of Glasgow, UK. Since 2008, Dr Okumu has been studying human-mosquito interactions and developing new techniques to complement existing malaria interventions and accelerate efforts towards elimination. His other interests include quantitative ecology of residual malaria vectors; mathematical simulations to predict effectiveness of interventions, improved housing for marginalised communities, and prevention of child malnutrition. 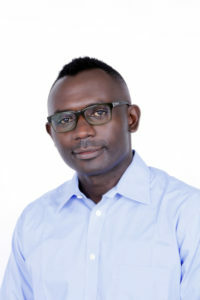 Dr Okumu was awarded by the American Society of Tropical Medicine and Hygiene the Young Investigator Award in 2009, a Welcome Trust Intermediate Research Fellowship in Public Health and Tropical Medicine (2014-2019), and most recently, a Howard Hughes-Gates International Research Scholarship (2018-2023). He is currently a co-chair of the Malaria Eradication Research Agenda consultative group on Tools for Elimination, an Associate Editor of the journal, Parasites & Vectors, and a Co-Chair of the WHO Vector Control Working Group on New Tools for Malaria Vector Control. He has also participated in various international expert panels on a wide range of subjects including, genetically modified mosquitoes and ivermectin for vector control, and the NEPAD Agency of the African Union’s agenda on biotechnology in Africa. He was inducted in 2016 as a Young Affiliate of the African Academy of Sciences. Fredros was also named among the 2016 Top 100 Global Thinkers by the US-based Foreign Policy Magazine.